These custom sliding wood doors are handcrafted from all natural, solid wood. All of our wood products are hand hewn with mortise and tenon joinery, this type of craftsmanship means that your custom doors are built to stand the test of time. The 8 panel sidelights are built with thick, dual pane glass. 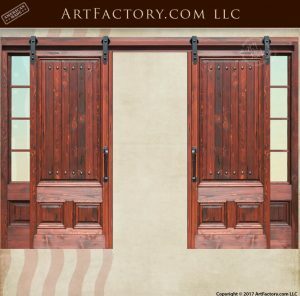 As shown, these doors feature a hand rubbed with a dark walnut finish (just one of hundreds of finish colors you can choose from). All of our wood finishes are hand applied using a multi-step process that blends the finish into the grain of the wood. This makes for a finish that will never fade, flake, or crack like paint or powder finishes. Most notably, all of our custom doors are made in the USA by master craftsmen, and guaranteed forever. With all of our doors, we include custom, wrought iron hardware, hand forged by master blacksmiths. On this custom sliding wood door, this includes the custom, fine art door pulls, wrought iron clavos, and heavy duty roller slides. All of these hardware products are built from pure, solid wrought iron, and are hand hammered over a coal fired forge. Furthermore, all of our hardware products are advance patinated using a hand applied, heat infused process that bonds the iron oxide patina to the metal at over 1000 degrees Fahrenheit. This detailed process assures that your hardware product will never rust, tarnish or corrode, will be virtually maintenance free, and will age gracefully, looking only better as the years go on. 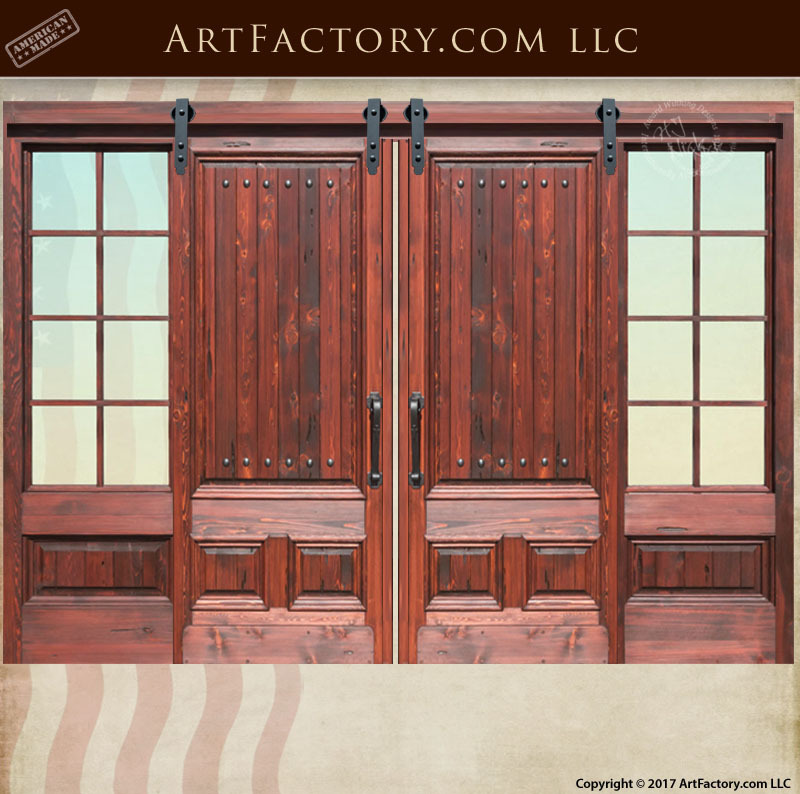 Investment quality custom doors, gates, and home furnishings built to fine art standards, with future antiquity value. Call ArtFactory.com for a custom quoted today at 1-800-292-0008. Why settle for the rest, when you can have the best?